Your HYUNDAI uses a remote key, which you can use to lock or unlock a door (and tailgate) and even start the engine. 2. Press the Door Lock button (1) on the remote key. 3. The hazard warning lights will blink and the chime will sound once if the lock button is pressed once more within four seconds. 4. Make sure the doors are locked by checking the position of the door lock button inside the vehicle. Do not leave the keys in your vehicle with unsupervised children. Unattended children could place the key in the ignition switch and may operate power windows or other controls, or even make the vehicle move, which could result in serious injury or death. 1. Press the Door Unlock button (2) on the remote key. The unlock mode changes alternately by pressing the lock button and unlock button on the remote key at the same time for 4 seconds or more. The hazard warning lights will blink four times to indicate that the mode conversion is completed. To cancel the panic mode, press any button on the remote key. Keep the remote key away from water or any liquid. If the remote key is inoperative due to exposure to water or other liquids, it will not be covered by your manufacturer’s vehicle warranty. Avoid dropping or throwing the remote key. Protect the remote key from extreme temperatures. 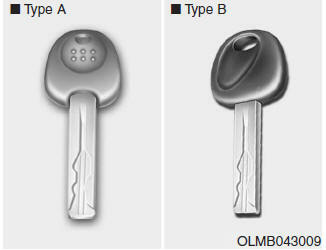 If the remote key does not operate normally, you can lock or unlock the door by using the mechanical key.